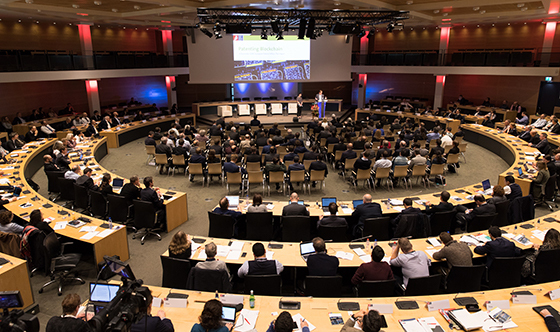 The EPO has held its first major conference on patenting blockchain. 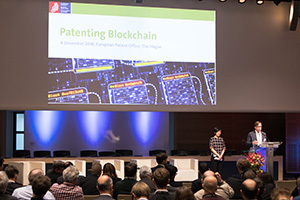 Attended by over 300 participants, the one-day event in The Hague yesterday explored the implications of blockchain for patent applicants and other stakeholders as the technology is applied to an ever-increasing variety of technical fields. In his welcome address EPO President António Campinos emphasised that "technologies of the fourth industrial revolution are gaining ever more momentum - and everyone in IP has to get to grips with technical developments that are driving this period of great change - and to understand their impact." Noting that patent applications for blockchain are rising fast, he underlined that such patents are nonetheless examined by the EPO in accordance with stable criteria developed on the basis of case law related to computer implemented inventions: "Our examination guidelines are constantly reviewed and adapted to ensure these criteria are transparent and that our practice remains predictable, both to examiners and external stakeholders." The first keynote speakers covered the blockchain basics, setting out the main principles, key players and areas of use for this new technology, and the first panel discussed the future impact of this now rapidly developing field and its links to other unfolding digital technologies like artificial intelligence (AI). Koen Lievens of the EPO and Wang Xinyi of CNIPA present the offices’ approaches to dealing with blockchain patent applications. Over the course of the day, participants also heard about the rising challenges of searching blockchain, legal issues associated with blockchain and, in particular, how the EPO examines blockchain patent applications. An analysis of the emerging patent landscape has revealed a steep increase in patent applications since 2015 - a trend similar to the one seen in the case of related technical fields such as AI and self-driving vehicles. Presentations on the approaches in China and Japan, which also show steep climbs in blockchain applications, were therefore met with particular interest, especially concerning the similarities and differences in the treatment of blockchain. 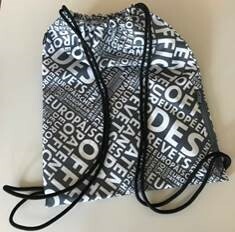 At the close of the conference the EPO's Vice-President of Operations Alberto Casado highlighted the potential of blockchain for innovation in an almost unlimited number of uses, saying that "we are at the beginning of a revolution. Blockchain started in the financial sector - but its spreading to all fields of industrial applications. It is growing in all fields".